To celebrate these stories we’ve discovered a selection of ten facts about children’s books, their authors, and their history. What fact would you add to this list? Some of the earliest “books” that combined both words and pictures, and that were read by younger people, are the Japanese illustrated scrolls of the 12th and 13th centuries. The final book in the Harry Potter series was the fastest-selling book of all time, with fifteen million copies sold in the first day alone. The series as a whole has sold an estimated 450 million copies worldwide, and the books have been translated into over sixty languages. It is thought that the first example of a fantasy story, for children, was F. E. Paget’s The Hope of the Katzekopfs, published in 1844. 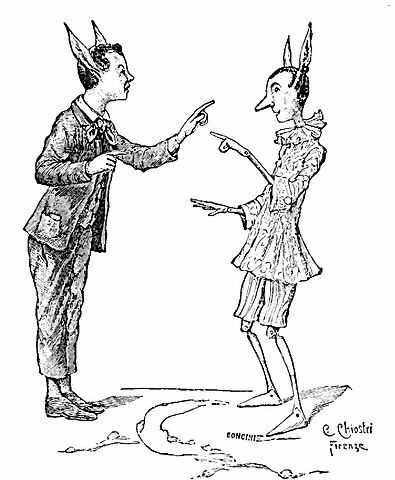 “Illustrations from ‘Le avventure di Pinocchio, storia di un burattino'” by Carlo Chiostri and A. Bongini. Public Domain via Wikimedia Commons. Quentin Blake, well-known for his illustrations for Roald Dahl and (more recently) David Walliams, has more than 300 illustrated books to his name, including Zagazoo which has no words and tells the story just through his illustrations. When Lewis Carroll (born Charles Lutwidge Dodgson), author of Alice’s Adventures in Wonderland, was fourteen he began to produce a series of family magazines to amuse his ten brothers and sisters. These contained writings such as humorous poems, limericks, and contributions from other family members. The original story of Pinocchio, arguably the most popular children’s book to come out of Italy, has the title character get in to many different scrapes that aren’t in the more well-known Disney version. This includes a fox and a cat trying to steal his money and Pinocchio being turned in to a donkey and sold to a circus. The typical number of pages in picture books (illustrated books, usually for younger children) is just over thirty. Before Enid Blyton became the famous author of the Famous Five stories her parents had wanted her to be a concert pianist. However she abandoned her musical studies to, train to be a teacher. The first children’s annual, a yearly publication usually associated with a magazine, was printed in 1645 by the parents of Zurich. They made it in celebration of New Year, for the children to find in the city library, and it was a single sheet made up of an engraving and some verse.